Poster Presentations: Poster presentations provide the opportunity for the presenter and the audience to talk with one another. Typically, each presenter is provided with a free-standing bulletin board, usually around 3. 5 feet high by 3 feet wide, on which to display the poster. [NOTE: The most common size for posters is 3. 5 - 4 feet high by 5. 5 - 6 feet wide. 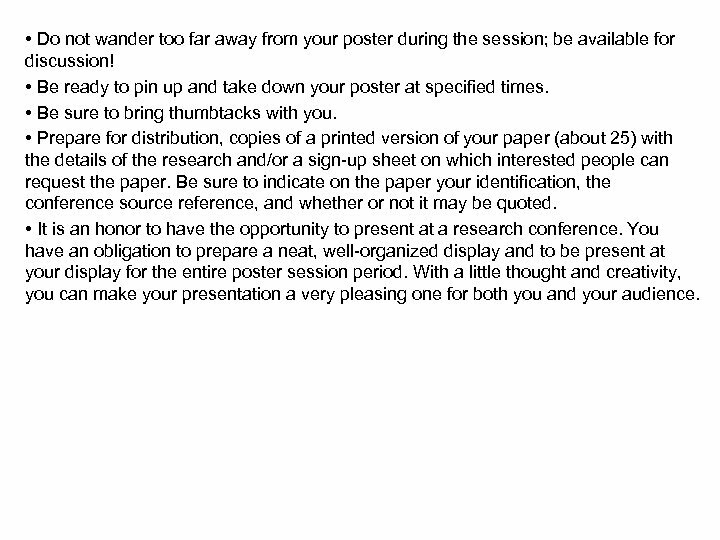 Check to make sure your poster adheres to the requirements of the conference at which you will be presenting. ] A relatively large number of posters will be displayed during each poster session. During the designated period, the audience moves through the poster displays, stopping to interact with those who are presenting research that is of special interest to them. Thus, the interaction between the presenters and the audience is likely to be more meaningful than is typically the case in paper sessions. 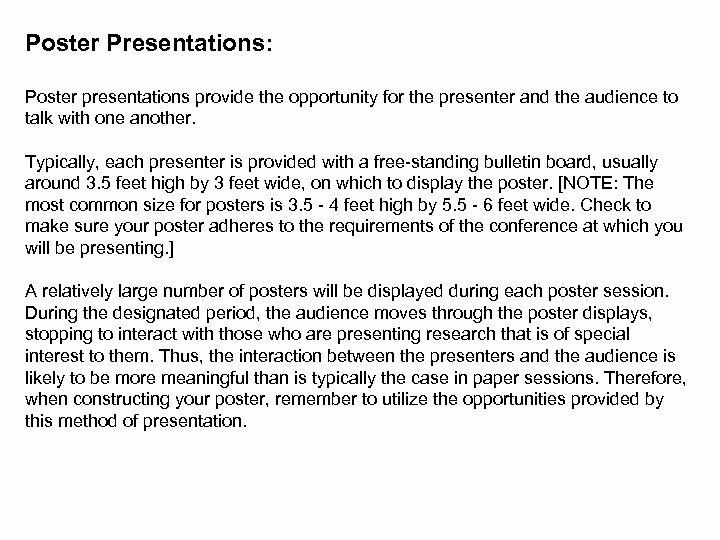 Therefore, when constructing your poster, remember to utilize the opportunities provided by this method of presentation. 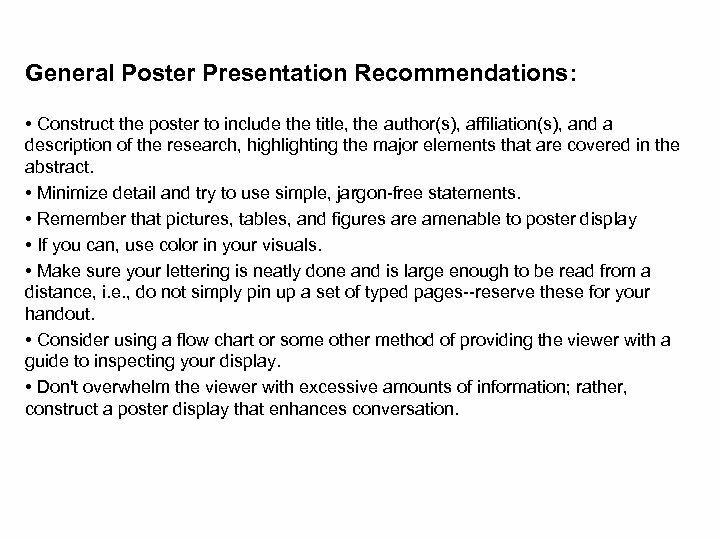 General Poster Presentation Recommendations: • Construct the poster to include the title, the author(s), affiliation(s), and a description of the research, highlighting the major elements that are covered in the abstract. • Minimize detail and try to use simple, jargon-free statements. • Remember that pictures, tables, and figures are amenable to poster display • If you can, use color in your visuals. 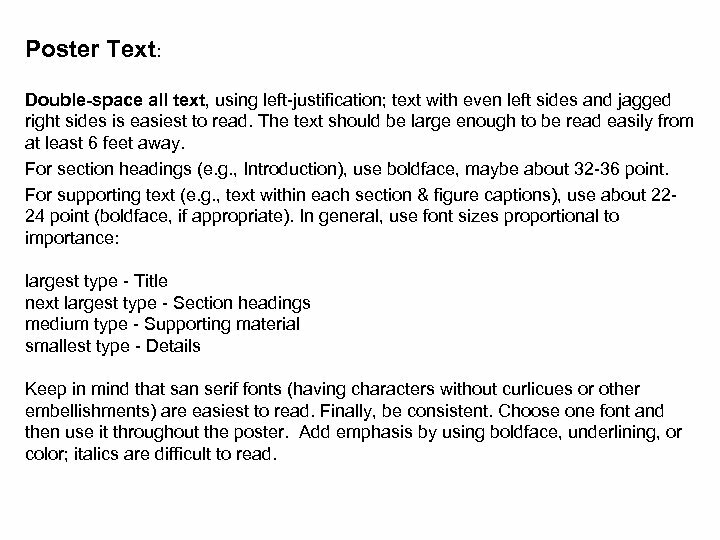 • Make sure your lettering is neatly done and is large enough to be read from a distance, i. e. , do not simply pin up a set of typed pages--reserve these for your handout. • Consider using a flow chart or some other method of providing the viewer with a guide to inspecting your display. • Don't overwhelm the viewer with excessive amounts of information; rather, construct a poster display that enhances conversation. 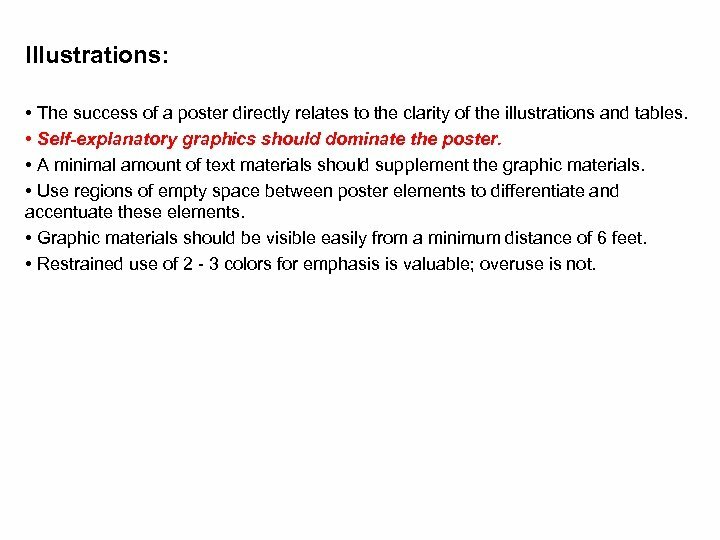 General Poster Format: • Determine the one essential concept you would like to get across to the audience. 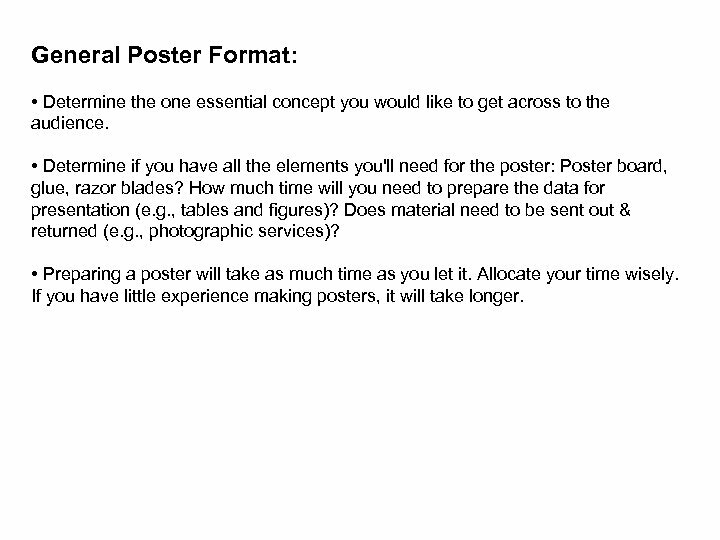 • Determine if you have all the elements you'll need for the poster: Poster board, glue, razor blades? How much time will you need to prepare the data for . presentation (e. g. , tables and figures)? Does material need to be sent out & returned (e. g. , photographic services)? 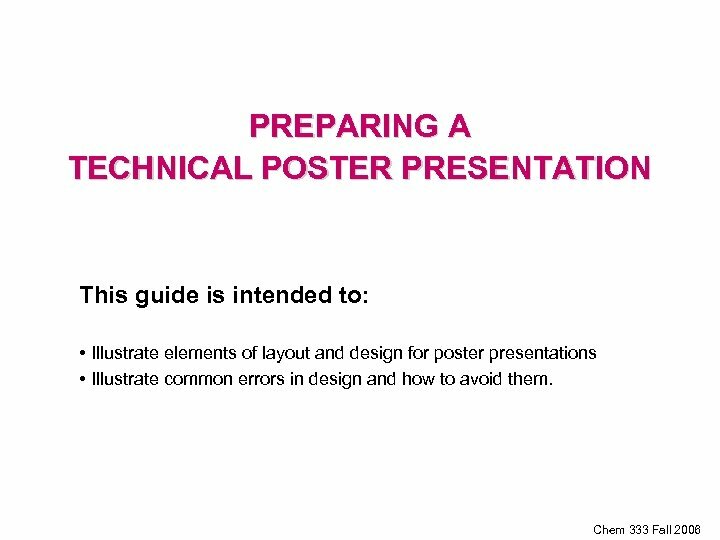 • Preparing a poster will take as much time as you let it. Allocate your time wisely. If you have little experience making posters, it will take longer. Sketch it out! Make a sketch of the poster. Arrange the contents in a series of 3, 4, or 5 columns. This will facilitate the flow of traffic past the poster. 4’ 3’ Place the elements of the poster in position: • The title and abstract across the top. • A brief introduction at the upper left. • The conclusions at the lower right. • Methods and Results in remaining space. The Title: • This part of the poster includes the title of the work, the authors names, & the institutional affiliations. Think BIG! • The poster title should be readable from 15 - 20 feet away. • If space permits, use first names for authors to facilitate interactions. Middle initials and titles are seldom necessary. • Use abbreviations where possible. • There are seldom rules regarding line justification of the title. Determine if you will left or center justify the text of the title once it has been formatted, based upon personal preferences and space constraints. 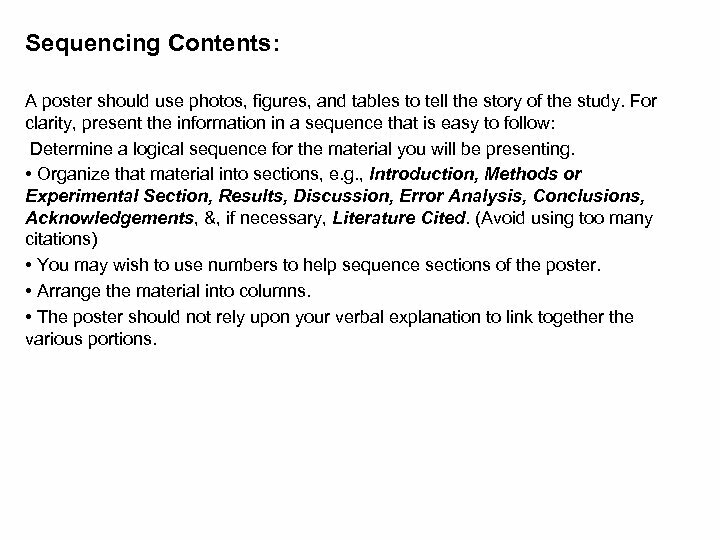 Sequencing Contents: A poster should use photos, figures, and tables to tell the story of the study. For clarity, present the information in a sequence that is easy to follow: Determine a logical sequence for the material you will be presenting. • Organize that material into sections, e. g. , Introduction, Methods or Experimental Section, Results, Discussion, Error Analysis, Conclusions, Acknowledgements, &, if necessary, Literature Cited. 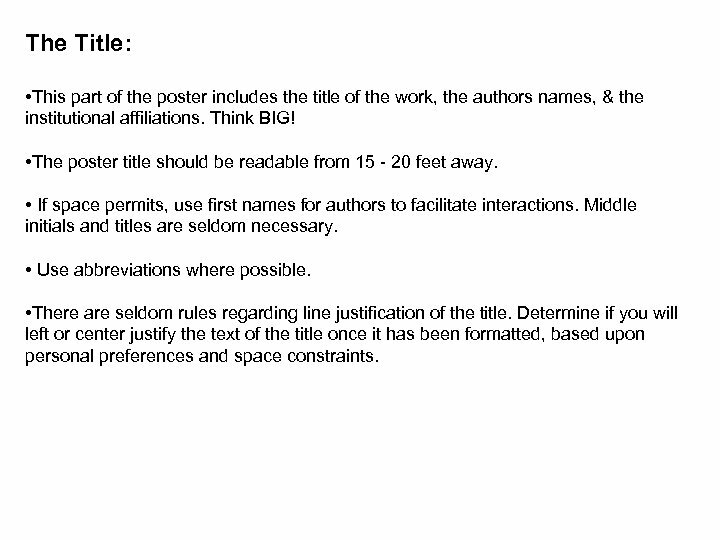 (Avoid using too many citations) • You may wish to use numbers to help sequence sections of the poster. 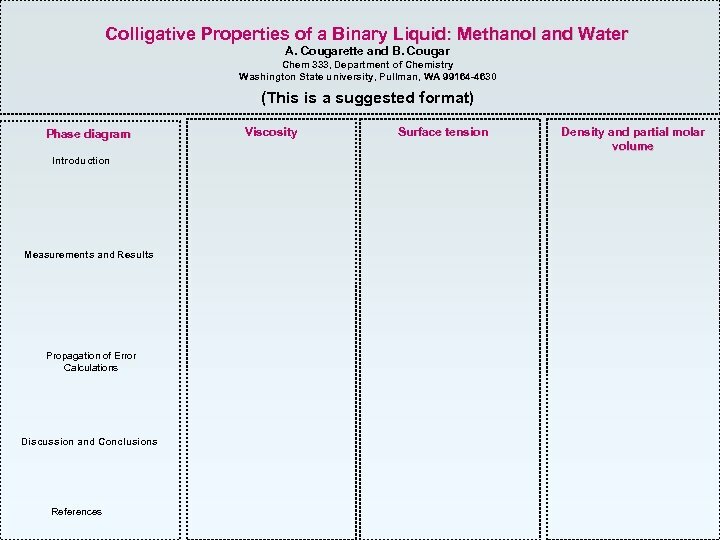 • Arrange the material into columns. 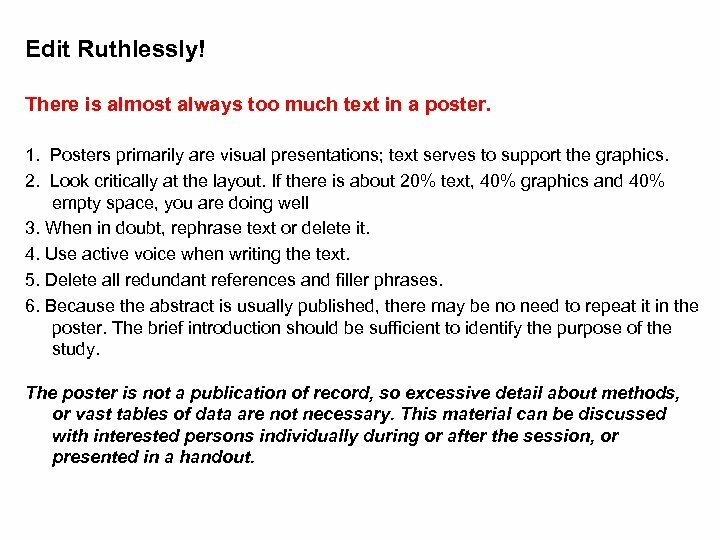 • The poster should not rely upon your verbal explanation to link together the various portions. Edit Ruthlessly! There is almost always too much text in a poster. 1. 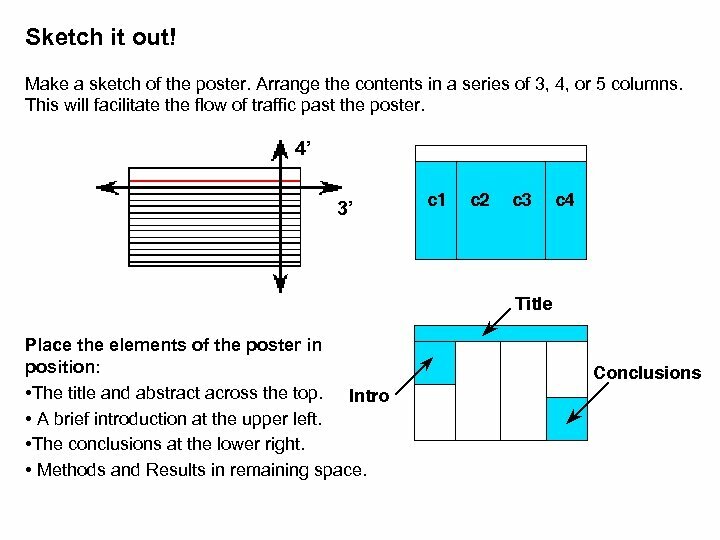 Posters primarily are visual presentations; text serves to support the graphics. 2. Look critically at the layout. If there is about 20% text, 40% graphics and 40% empty space, you are doing well 3. When in doubt, rephrase text or delete it. 4. Use active voice when writing the text. 5. Delete all redundant references and filler phrases. 6. Because the abstract is usually published, there may be no need to repeat it in the poster. The brief introduction should be sufficient to identify the purpose of the study. The poster is not a publication of record, so excessive detail about methods, or vast tables of data are not necessary. This material can be discussed with interested persons individually during or after the session, or presented in a handout. Illustrations: • The success of a poster directly relates to the clarity of the illustrations and tables. • Self-explanatory graphics should dominate the poster. • A minimal amount of text materials should supplement the graphic materials. • Use regions of empty space between poster elements to differentiate and accentuate these elements. • Graphic materials should be visible easily from a minimum distance of 6 feet. • Restrained use of 2 - 3 colors for emphasis is valuable; overuse is not. 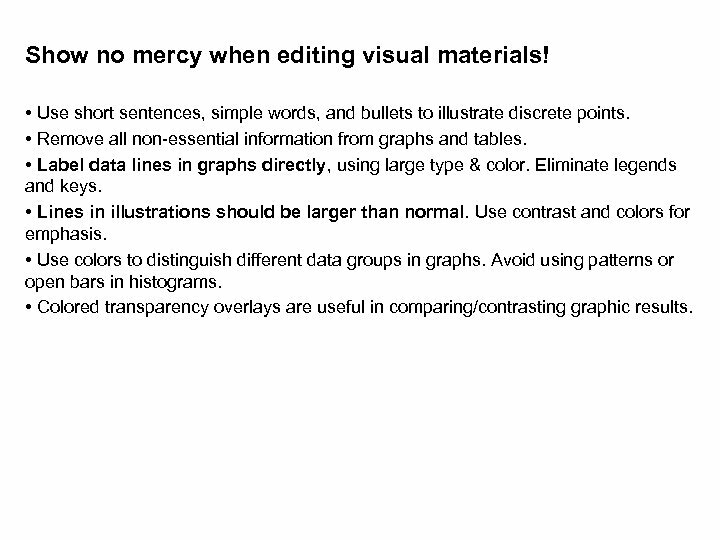 Show no mercy when editing visual materials! • Use short sentences, simple words, and bullets to illustrate discrete points. • Remove all non-essential information from graphs and tables. • Label data lines in graphs directly, using large type & color. Eliminate legends and keys. • Lines in illustrations should be larger than normal. Use contrast and colors for emphasis. • Use colors to distinguish different data groups in graphs. Avoid using patterns or open bars in histograms. • Colored transparency overlays are useful in comparing/contrasting graphic results. Poster Text: Double-space all text, using left-justification; text with even left sides and jagged right sides is easiest to read. The text should be large enough to be read easily from at least 6 feet away. For section headings (e. g. , Introduction), use boldface, maybe about 32 -36 point. For supporting text (e. g. , text within each section & figure captions), use about 2224 point (boldface, if appropriate). In general, use font sizes proportional to importance: largest type - Title next largest type - Section headings medium type - Supporting material smallest type - Details Keep in mind that san serif fonts (having characters without curlicues or other embellishments) are easiest to read. Finally, be consistent. Choose one font and then use it throughout the poster. Add emphasis by using boldface, underlining, or color; italics are difficult to read. 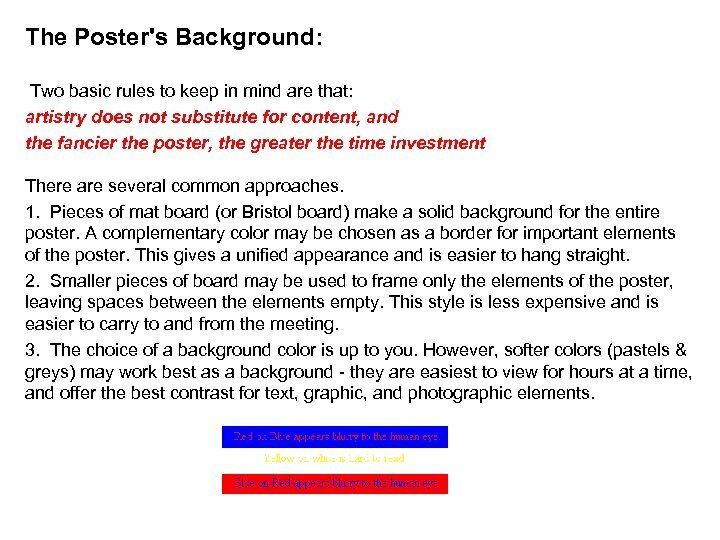 The Poster's Background: Two basic rules to keep in mind are that: artistry does not substitute for content, and the fancier the poster, the greater the time investment There are several common approaches. 1. Pieces of mat board (or Bristol board) make a solid background for the entire poster. A complementary color may be chosen as a border for important elements of the poster. This gives a unified appearance and is easier to hang straight. 2. Smaller pieces of board may be used to frame only the elements of the poster, leaving spaces between the elements empty. This style is less expensive and is easier to carry to and from the meeting. 3. The choice of a background color is up to you. However, softer colors (pastels & greys) may work best as a background - they are easiest to view for hours at a time, and offer the best contrast for text, graphic, and photographic elements. Use a colored background to unify your poster: 1. Muted colors, or shades of gray, are best for the background. Use more intense colors as borders or for emphasis, but be conservative - overuse of color is distracting. 2. 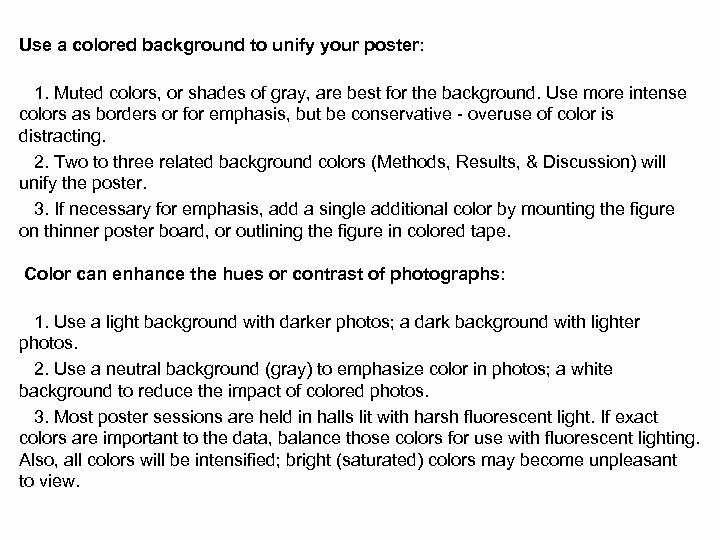 Two to three related background colors (Methods, Results, & Discussion) will unify the poster. 3. If necessary for emphasis, add a single additional color by mounting the figure on thinner poster board, or outlining the figure in colored tape. Color can enhance the hues or contrast of photographs: 1. Use a light background with darker photos; a dark background with lighter photos. 2. Use a neutral background (gray) to emphasize color in photos; a white background to reduce the impact of colored photos. 3. Most poster sessions are held in halls lit with harsh fluorescent light. If exact colors are important to the data, balance those colors for use with fluorescent lighting. Also, all colors will be intensified; bright (saturated) colors may become unpleasant to view. Poster printing and assembly: A one-piece Poster is easiest to carry. 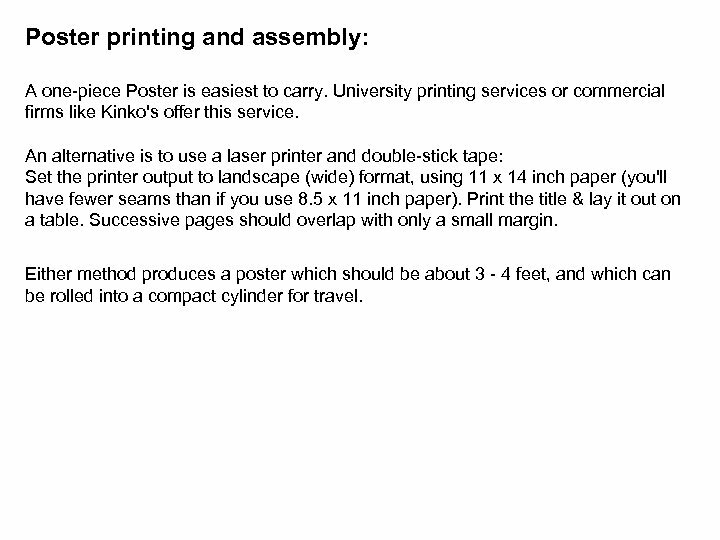 University printing services or commercial firms like Kinko's offer this service. An alternative is to use a laser printer and double-stick tape: Set the printer output to landscape (wide) format, using 11 x 14 inch paper (you'll have fewer seams than if you use 8. 5 x 11 inch paper). Print the title & lay it out on a table. Successive pages should overlap with only a small margin. Either method produces a poster which should be about 3 - 4 feet, and which can be rolled into a compact cylinder for travel. 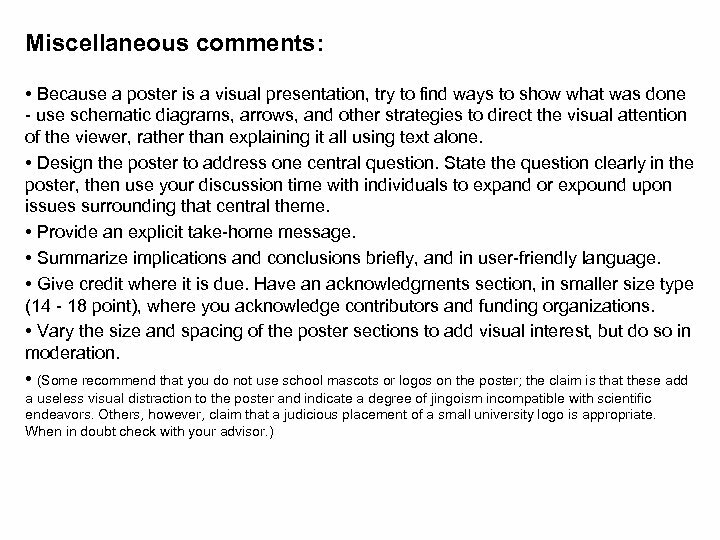 • Do not wander too far away from your poster during the session; be available for discussion! • Be ready to pin up and take down your poster at specified times. • Be sure to bring thumbtacks with you. • Prepare for distribution, copies of a printed version of your paper (about 25) with the details of the research and/or a sign-up sheet on which interested people can request the paper. Be sure to indicate on the paper your identification, the conference source reference, and whether or not it may be quoted. • It is an honor to have the opportunity to present at a research conference. You have an obligation to prepare a neat, well-organized display and to be present at your display for the entire poster session period. With a little thought and creativity, you can make your presentation a very pleasing one for both you and your audience. 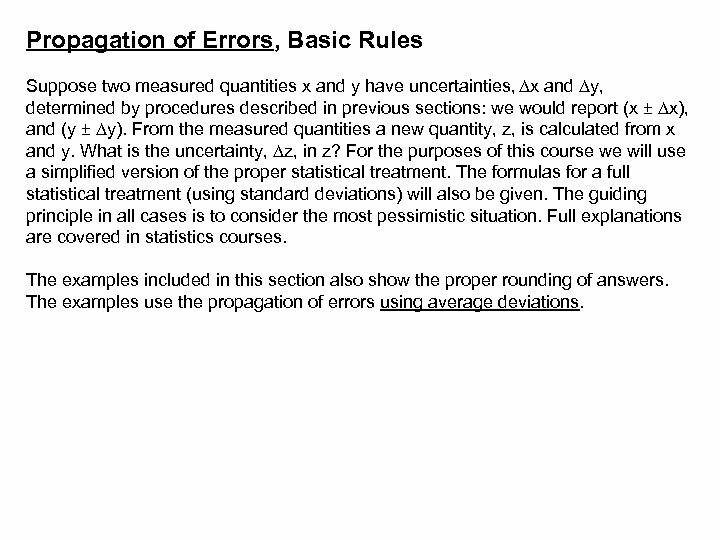 Propagation of Errors, Basic Rules Suppose two measured quantities x and y have uncertainties, Dx and Dy, determined by procedures described in previous sections: we would report (x ± Dx), and (y ± Dy). From the measured quantities a new quantity, z, is calculated from x and y. 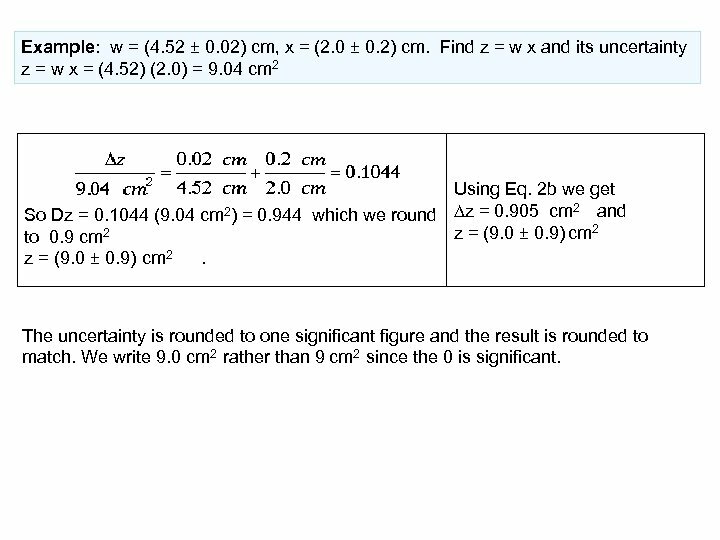 What is the uncertainty, Dz, in z? For the purposes of this course we will use a simplified version of the proper statistical treatment. The formulas for a full statistical treatment (using standard deviations) will also be given. The guiding principle in all cases is to consider the most pessimistic situation. Full explanations are covered in statistics courses. The examples included in this section also show the proper rounding of answers. 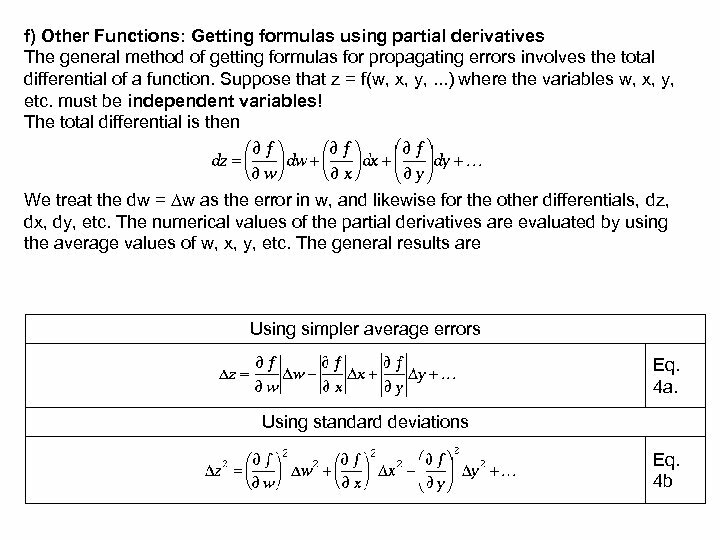 The examples use the propagation of errors using average deviations. Example: w = (4. 52 ± 0. 02) cm, x = (2. 0 ± 0. 2) cm. Find z = w x and its uncertainty z = w x = (4. 52) (2. 0) = 9. 04 cm 2 Using Eq. 2 b we get 2 So Dz = 0. 1044 (9. 04 cm 2) = 0. 944 which we round Dz = 0. 905 cm and z = (9. 0 ± 0. 9) cm 2 to 0. 9 cm 2 z = (9. 0 ± 0. 9) cm 2 . The uncertainty is rounded to one significant figure and the result is rounded to match. We write 9. 0 cm 2 rather than 9 cm 2 since the 0 is significant. Term Brief Definition Absolute error The actual error in a quantity, having the same units as the quantity. Thus if c = (2. 95 ± 0. 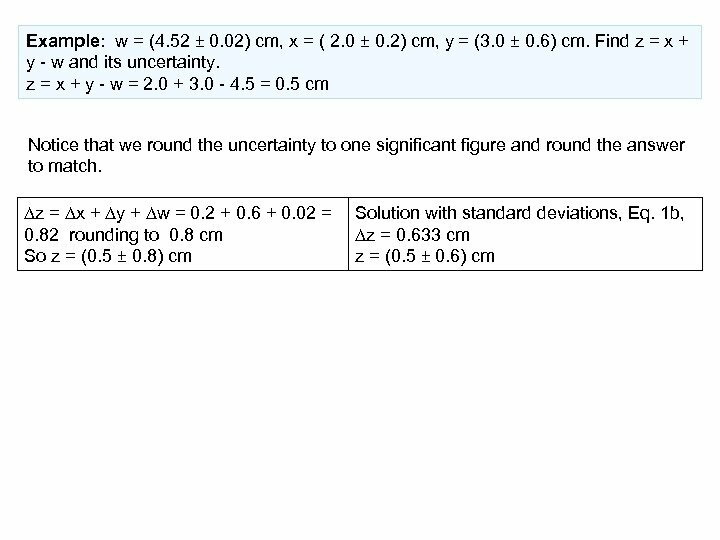 07) m/s, the absolute error is 0. 07 m/s. See Relative Error. Accuracy How close a measurement is to being correct. For gravitational acceleration near the earth, g = 9. 7 m/s 2 is more accurate than g = 9. 532706 m/s 2. See Precision. Average When several measurements of a quantity are made, the sum of the measurements divided by the number of measurements. Average Deviation The average of the absolute value of the differences between each measurement and the average. See Standard Deviation. Confidence Level The fraction of measurements that can be expected to lie within a given range. Thus if m = (15. 34 ± 0. 18) g, at 67% confidence level, 67% of the measurements lie within (15. 34 - 0. 18) g and (15. 34 + 0. 18) g. If we use 2 deviations (± 0. 36 here) we have a 95% confidence level. Deviation A measure of range of measurements from the average. Also called error or uncertainty. Error A measure of range of measurements from the average. Also called deviation or uncertainty. Estimated Uncertainty An uncertainty estimated by the observer based on his or her knowledge of the experiment and the equipment. This is in contrast to ILE, standard deviation or average deviation. Gaussian Distribution The familiar bell-shaped distribution. Simple statistics assumes that random errors are distributed in this distribution. Also called Normal Distribution. Independent Variables Changing the value of one variable has no effect on any of the other variables. Propagation of errors assumes that all variables are independent. 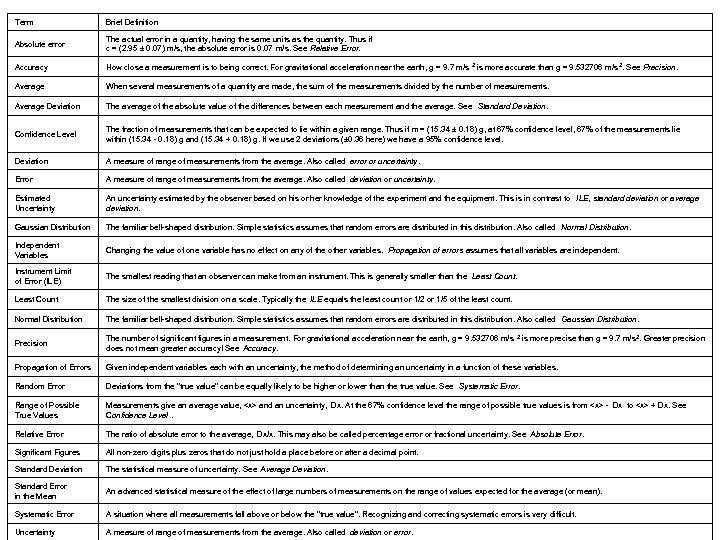 Instrument Limit of Error (ILE) The smallest reading that an observer can make from an instrument. This is generally smaller than the Least Count The size of the smallest division on a scale. Typically the ILE equals the least count or 1/2 or 1/5 of the least count. Normal Distribution The familiar bell-shaped distribution. Simple statistics assumes that random errors are distributed in this distribution. Also called Gaussian Distribution. Precision The number of significant figures in a measurement. For gravitational acceleration near the earth, g = 9. 532706 m/s 2 is more precise than g = 9. 7 m/s 2. Greater precision does not mean greater accuracy! See Accuracy. 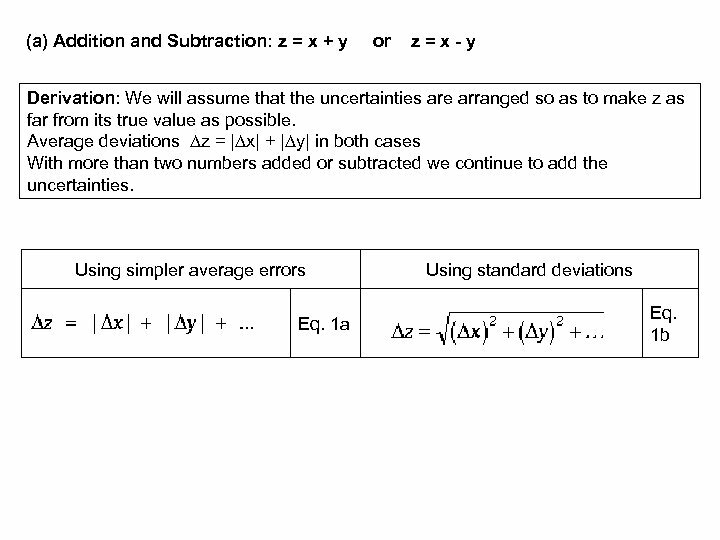 Propagation of Errors Given independent variables each with an uncertainty, the method of determining an uncertainty in a function of these variables. Random Error Deviations from the "true value" can be equally likely to be higher or lower than the true value. See Systematic Error. 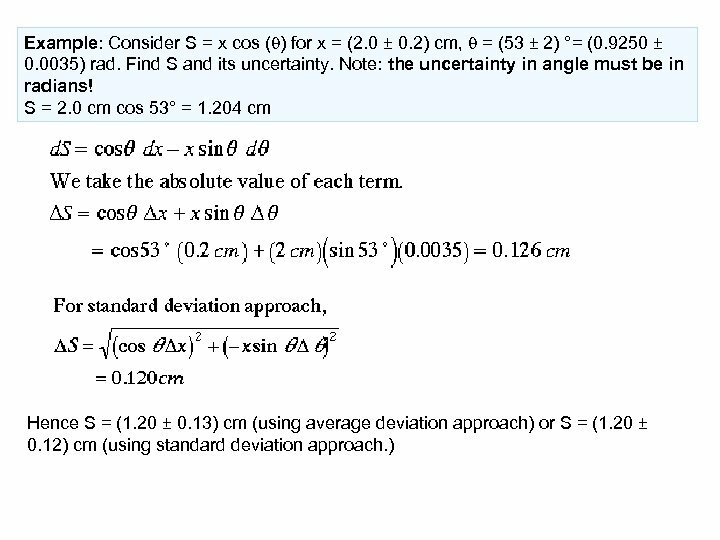 Range of Possible True Values Measurements give an average value, and an uncertainty, Dx. At the 67% confidence level the range of possible true values is from - Dx to + Dx. See Confidence Level. 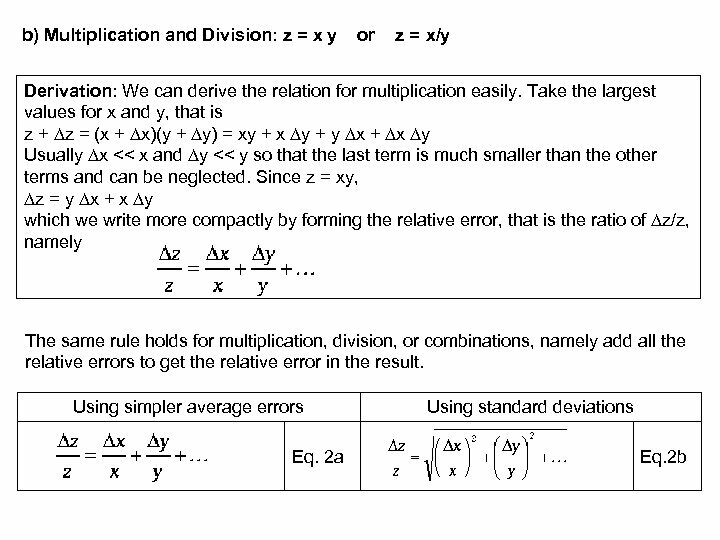 Relative Error The ratio of absolute error to the average, Dx/x. This may also be called percentage error or fractional uncertainty. See Absolute Error. Significant Figures All non-zero digits plus zeros that do not just hold a place before or after a decimal point. Standard Deviation The statistical measure of uncertainty. See Average Deviation. Standard Error in the Mean An advanced statistical measure of the effect of large numbers of measurements on the range of values expected for the average (or mean). Systematic Error A situation where all measurements fall above or below the "true value". Recognizing and correcting systematic errors is very difficult. Uncertainty A measure of range of measurements from the average. Also called deviation or error.